Halibut fishing in Seward, Alaska is second to none when you have a top-notch captain and crew. 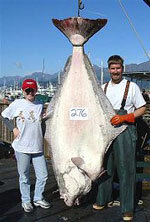 Day-in and day-out the best halibut fishing charters in Seward bring in some huge loads of barn-door Alaska halibut. At the same time, other crews may struggle to find a few small fish for their group. Not knowing which outfitter to select for your Alaska halibut fishing trip can lead to a frustrating and unproductive day on the water. This is a waste of time and money. Selecting one of Seward's most reputable and experienced Alaska halibut fishing charter companies will greatly increase your chances for success. Captain Jack's is located directly on the docks in Seward. Each day we see catches brought to the scales by many of the charter boats in the Seward halibut fishing fleet. Having a first hand look at each, we know which Alaska halibut fishing charter companies struggle and which ones thrive. We love to see boatloads of smiling fishermen lugging heaping cartloads of Alaska halibut to the hanging rack. If you want to tip the scales in your favor we highly recommend selecting one of the following Seward, Alaska halibut fishing charters to help you land the fish of a lifetime. Captain Steve Zernia, is a second-generation Alaska Charter Fishing Captain. Friendly and soft spoken, Steve enjoys helping you experience an unforgettable day of fishing. Whether you are a seasoned angler or a novice, Steve will work hard to see that you savor the same pleasure and thrill. He will give his all out effort to put you on fish and make your Alaska fishing dreams come true. We are dedicated to providing the finest service and equipment to your group. Our guides are all long time Alaskans and have fished the waters of Seward exclusively for many years. The ultimate deep-sea fishing experience awaits you when you fish with Saltwater Safari Company. Not only will you be fishing the most productive halibut grounds in the world, but you'll be fishing with the company that pioneered these waters. Enjoy an exciting day of deep sea halibut or Salmon fishing aboard our comfortable boats. Owned and operated by Jon Tippit, A long time Alaskan who always has fishing on his mind . This guy loves fishing, especially for silvers and halibut. With over 60 boats operating out of our business, we offer full day and half day Charters or we can customize a package. Choose the Trip that's Right for You. Takes you to the heart of these wonders while Che'nai Bed and Breakfast offers you a comfortable and relaxed atmosphere in which to sit on a porch with your feet up and relive the days adventures. Come on down and let Capt. Suzy show you the beauty and excitement of fishing, sightseeing and wildlife viewing on the wild coast of the Gulf of Alaska. We offer reasonably priced charters for individuals or we can accommodate small or large groups. You may also opt to charter a boat for your exclusive use. Fish Alaska with HILL NORVELL,owner and operator of Hill Norvell Alaskan Fishing. Your customized Alaskan fishing trip begins here. A secluded campground near Seward, Alaska on Resurrection Bay offers a wide range of affordable fishing, boating, kayaking, dog mushing, horseback riding, flight seeing, wildlife and glacier tours, and hiking opportunities.